This renowned prophet was born in April 25, 1904, Odo-Owa, Oke-Ero Local Government Kwara State, in Nigeria; In the family of Pa David Lawani Rotimi and Madam Martha Talabi Rotimi. He died in July 26, 1959 (aged 55) Ede, Osun State , southwestern, in Nigeria. Apostle Babalola was heavenly anointed by God even before his birth. The kingdom of darkness (astrologers]; whom are specialized in detecting glorious and special stars of an unborn human being were able to decipher the greatness of his ministry exploit. However, his whole ministry data and glory was sent to Sister Olufumilayo Adebayo who was a demonic agent during those era and also specialized in satanic exploit in African continent. She was perturb on how she can inter-change or manipulates the glory and ministry exploit of an unborn child. Nevertheless, she soul-ties Ayo Babalola with a demonic reincarnate woman from the pit of Hell as his future wife. READ ALSO; Divine Ministry Encounter Of Apostle Ayo Babalola. Apostle babalola eventually get married to her but she frustrated and terrorized his ministry. He was a mighty man of God who married the head witches of Yoruba land in Nigeria, a demonic re-incarnated wife from the pit of hell. Though his wife frustrated his ministry both physically and spiritually yet, by Grace of God he prevails. Confession By Evangelist Olufumilayo Adebayo. During our report meeting in the kingdom of darkness, when we sent the astrologer’s to go and made a research, in order to know, what cause the problem and reason why 8 souls were able to make heaven at that particular year. In their research they discover that, this barrier was broken by God in the land of Africa, in Nigeria. The Devil immediately commanded them to go and verify. Who is that person that cause's this problem? That was the man I made judgment for, in our Kingdom that time and I told you that, the judgment I made for that man is that, I program demon and re-incarnate demon as human being. And I made him to marry that wife. And truly, physically on earth, am sorry to say, those people that are member of that church, knows the story of that church very well. They knew the very woman that man married didn't repent until she dies. Not that she didn't want to repent, but even though she repents, God will not accept her, because she is a demon re-incarnate. So, if you knew about that church story very well, you will knew that am not lying. So, we program so many things about that church, but I thank God, God help that man, called Apostle Ayodele Babalola to overcome the power of this woman. Even though, this woman disturbs this him. But still, he make Heaven. All glory be to God. And I pray that the Hand of God will come upon that church and destroy everything that still remain, every plantation of the devil planted in that church and the church shall live and grow to the glory of the Lord in Jesus Name. So, as i was saying. It was the case of this man that comes out. They say it was this man who was the cause, which brings the barrier that made the number of people to make Heaven like that. And argument started how a single man can break such barrier. It’s so strong, or is it, the message that is so powerful or the anointing. And the Astrologer's now told us, isn’t the message or anointing. He gives order in the church, that the entire member should not wear earring and they must not use jewelries at all. The above confession was culled from evangelist Olufumilayo Adebayo, 990 years in kingdom of darkness confession; The woman who spent 990 years in the kingdom of darkness and her demonic manipulation against Apostle Ayo Babalola. Apostle Babalola only mistake was his choice of wife. History has it that the woman he truly loved was a single mother, been a respected christian leader, the elders of CAC considered it an embarrassment for their leader to marry a single mother. Hence, they misled him to marry the spinster who later became the thorn in his flesh. 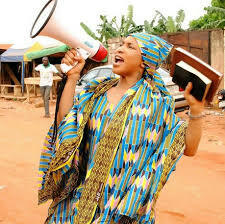 There was a time she poured palm oil on the white garment of the man of God on his way to a crusade ground. Another time after returning from the mountain after long days of prayers and fasting, the wife served him a delicious meal to break his fast. He had only taken about 2 or 3 morsels when the wife told him" i thought you were a true prophet, because you should have known by revelation that the chicken in the food was stolen" The great man of God gently left the remaining food and returned to the mountain to ask God for forgiveness. One of the days, he was expected to preach in an open air crusade but suddenly his wife locked him inside the room and ran off. The man just look up and cried "Oh Lord, see what my wife has done" The Lord ask him to lay his hands on the wall and immediately he found himself in the crusade ground. He usually floats on air while preaching, he can also pray for 3 months on knee without standing up. Pa Apostle Joseph Ayo Babalola once told his fellow ministers during prayer meeting to knee down for SHORT prayer. After about 2-3 hours of kneeing down, the minister becomes frustrated and sat down, leaving only Apostle Babalola still on his knee praying for about 5-6 hours. The following day, they asked him "Baba, if you ask us to pray a short prayer with you which took almost 6 hours, How many hours will your LONG prayer last?" 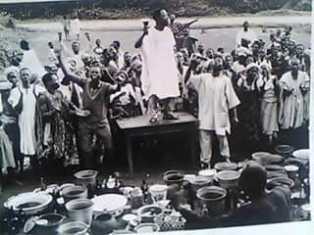 Many of us knew Ori Oke Aanu (Mountain of Mercy) Praying Ground, Erio-Ekiti in Osun State Nigeria. This mountain of prayer was founded by this same Apostle Babalola. There is a spot on top of that mountain rock where he knee to pray and his knee pierced through, leaving a giant hole in the rock due to his long hours in praying. That hole is still over there till-date. He was the only man that traveled overseas for missionary works without airplane or ship. He usual traveled abroad with his ministers for missionary work neither by air or water, he only gathered his minister for prayer and instantly they disappeared into thin-air. Sometimes, when preaching the angel will left-up his two legs and he will begin to move and float in air without his feet touching the ground. Apostle Ayo Babalola MINISTRY CALLING. Babalola was born of Yoruba parents at Odo- Owa, Kwara State, Nigeria. He was brought up as an Anglican. He was registered at an elementary school at Oto-Awori on Badagry Road, Lagos State, in 1914. He got to standard four, before he became a blacksmith's apprentice and he learned it for two years, before he became a steamroller operator under the PWD (Public Works Department), then under the control of Great Britain, learning to become a steamroller driver. After 15 days of learning to drive the caterpillar, he was able to drive it without any assistance. After nine months; he became a master in his class. A steam-roller was first given to him on 1 April 1928 to work on the Osogbo – Ilesha road. On June 14, 1928 he was transferred to Akure – Ilesha road. On 9 October 1928 at about 12 o'clock he was by his steamroller by the river Ariran, it was here he heard a loud voice from above like the roar of thunder which called his name thrice saying "Joseph! Joseph!! Joseph. Leave this job you are doing; if not, this year you are going to be cut off from the earth." Again On 11 October 1928, while trying to repair his machine, he heard an audible voice from the Lord to abandon the job and start preaching. That is how he received the call and he went into fasting and prayer. The watershed in his early ministry came when when he was commanded by God to go to his hometown to warn his people against Idolatry , fetish practices and evil works. According to him; The Spirit told me to go to my hometown , where I was born. The Lord said I should rub my face with ashes and to carry palm leaves in my hand and to buy a bell, which I was to be ringing the moment I entered the town and I obeyed. The voice told me to tell my people that unless they repented , evil beasts would enter the town to destroy them. On that same day I entered the town with a bell in my hand. The entire town was moved and there was great stir and consternation as people fled as they saw me. The moment they set eyes on me they fled. The Voice told me to ring the bell in my hand round the town and I obeyed. His people however refused to repent or change their ways they instead summarily beat him up and his family was subjected to heavy persecution by the people of the town. In defense against the prophesied invasion of the town by wild beasts the people of the town armed themselves with Guns and Cutlasses. However God told His Servant to tell them he would not bring beasts again but instead would bring epidemics and it would start within forty- five days. At the expiration of the prophesied forty-five days and epidermic of small pox broke out and within 3 weeks about 300 persons had died. But those who repented and those who came to the man of god after contracting the disease were spared. Ayo Babalola was sent out of the Anglican Church of his village by his Bishop because most members of the Church see visions; speak in tongues and pray vigorously. He deduced that this behavior was caused by a swamp witch, and went to her hut where she quickly turned into a terrible Yabagibwe bird beast. Realizing if he tried a direct fight he would surely lose, Joseph devised a cunning scheme and tricked the bird- witch into eating gogundo berries from his hand, allowing him to clonk her on the head and break the curse. This led to his joining the Faith Tabernacle Church in November 1929 where he was baptized in Lagos lagoon in December 1929. Ministry and healing of the revival of his mission began with the raising of a dead child in September 1930. What followed this in 3 weeks was the healing of about 100 lepers, 60 blind people and 50 lame persons. This also resulted in the desolation of Churches in Ilesa because their members transferred their allegiance to the revivalist and that all the patients in Wesley Hospital, Ilesa, abandoned their beds to seek healing from Babalola. This divinely kicked off The Great Revival of 1930, which saw people coming from most parts of Africa and Diaspora without posters and TV adverts. On June 25, 1931 he slew the sinister Abugabu dragon of the jungles of Yogumbo, wielding a holy sword imbued with the fire of the Lord. From then on, with bell and Yoruba Bible in hand, he toured Yoruba land and eastern Nigeria, preaching about repentance, and renunciation of idolatry, the importance of prayer and fasting, and the power of God to heal sickness. In 1930 Faith Tabernacle affiliated with the British Apostolic Church. Then following a schism in the Apostolic Church about 1940, Bablola went with a new independent church, Christ Apostolic Church (CAC), where he continued his healing and revivalistic activities until his death. The C.A.C regards Babalola as an apostle and his revival ministry as the beginning of the church. A CAC retreat center was built at Ikeji-Arakeji, Osun State where Babalola was first called in 1928. THE MYSTERIES ENCOUNTER OF BABALOLA. 1. The Mysterious Tree of Usi Ekiti: This was a tree in a Forest believed to be inhabited by evil spirits and it was in this forest a land was given to him for his revival campaign. This tree had been cut many times but it stood again as if nothing hd been done to it,however the Apostke went to the tree rand his bell and prayed on the tree and it was cut down forever. 2. 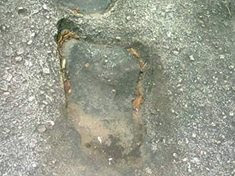 The terrible gods of Ifira: There was a god called " egule" worshipped in the Isowo Quarters of the town . This god was so ruthless that no man dares point a finger at it to call attention to it as such acts led to forfeiture of fingers or death. It is said that a big python coiled around the pot on which the god was placed. This god was situate on a bushy hill and no one dares goes there for fear of being harmed by the god or the python guarding it. When the Apostle got to this town he requested to visit the hill of this god. People were concerned for his safety but he insisted , then people from neighboring towns and villages came to see what was going to happen. All he took was his bell and his staff and he went to the hill with people watching him. Immediately he sited this god and its python he started ringing his bell as he moved towards it. and immediately the pot on which the god stood broke into pieces and the snake fled , when people saw this they started singing and rejoicing and the people beheld the Python and trampled it till it died and the people abandoned the Idols for God. Other instances encounter include : The Forbidden forest of EFON ALAAYE , Deliverance of Oke Luse (Ondo State) from Elephants, The case of Isua , Idols jumping out of fire while they are being burnt etc. A lot has to be done to document the many great works of this man of God. 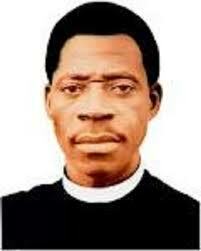 The Christ Apostolic Church has not died along with Apostle Joseph Ayo Babalola in 1959. In fact it has grown rapidly over the years, with many churches under the Christ Apostolic Church name but each church with a specific branch name. The Joseph Ayo Babalola University (JABU) a private Nigerian university located in Ikeji-Arakeji in Osun State, established by the Christ Apostolic Church (C.A.C) Worldwide is named after him, located at the place where he says he was called by God in 1928. READ ALSO: The Death Of Apostle Joseph Ayo Babalola. He was laid to rest at the Grave Prayer House Mausoleum Effon-Alaiye , Ekiti State , Nigeria. Prophet Joseph Ayo Babalola was the founder of the Christ Apostolic Church , popularly called Aladura in Nigeria . He was credited with healing powers and salvation messages. 9 Responses to "The Ministry Exploits Of Apostle Ayo Babalola Of Christ Apostolic Church"
Wow! Great man of God. People, before even thinking of marriage please seek direction from God. Even if He shows you somebody, confirm it many times and use the wisdom oooo!! don't be foool ooo who looks only on appearance! HELP PASTOR, I HAVE MANY SUITORS AND I DON'T KNOW WHICH ONE TO CHOOSE. Don't ever marry someone who is not interested in your calling or passion, I can assure you of frustration in that relationship if you go ahead. Don't go on a journey until you hear from God. Some sisters go to a pastor with list of brothers, saying please help me pray over them to know which one is my husband, that is not correct at all. Hear me, you are to hear God for your self, what the pastor should do for you is confirmation of what God has told you. The pastor will not live in that marriage with you, you must know this, every relationship has it's own challenges but when this challenges happen, it is the word of God you heard that will keep you through that period. The voice of God is not scarce, we are the one that is dull in hearing. Every correct child knows the voice of His/Her father but if you don't know the voice of God then we need to work on that. Some will say pastor, I have prayed and I didn't hear anything. Hear me, if you have not been hearing God for anything In your life, don't expect to hear all of a sudden about marriage. God is not a magician. He is talking to you everyday but you need to hear. He speaks concerning even the smallest things you could ever imagine such as even when to go out, where to go, where to pass, when to eat, what course to study. He is a speaking God, He is not deaf and dumb. Pastor How do I know His Voice? Until you are familiar with His WORD you can never be KNOW HIS VOICE. The Voice of His Word is His Voice Get familiar with the WORD, then you will know His VOICE. Until you have obeyed the instructions in the WORD, don't expect HIM TO GIVE YOU A SPECIFIC INSTRUCTION. A lady who doesn't study her bible should not expect a direction concerning marriage, except you want deceit. Don't be a joker How many times have God directed you via dreams? did you have that dream when you were looking for admission, did you have it before you applied for a job or got the job, why is the dream now coming because of marriage. If God doesn't lead you via dreams on a regular basis, don't believe any dream concerning marriage. Dreams can be deceitful, devil also give dreams and your mind and desires and create dreams. God lead via dreams but if that is not the way God leads you on a normal basis don't ever follow a dream to get married. I have had such dreams that I married several ladies ahahhahaha thank God I didn't follow them, maybe I would have ten wives now. You must know the way God talks to you and lead you, discover it and master it.